What does Dubai police chief have to say about that? 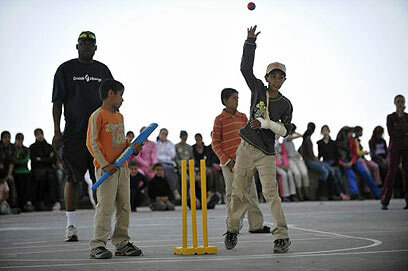 The Dubai-based International Cricket Council has awarded the Israel Cricket Association with a prize for a cross-border initiative bringing together Jews and Bedouins in the southern Negev desert. The winning project was initiated by Stanley Perlman, the Israel Cricket Association's chairman. The Association's director, Naor Gudker, who is also an international umpire, told Ynet that cricket is among the top three sports in many Arab states and Asia, including Pakistan and Dubai. "A very high percentage of the managers, players, and coaches in global cricket are Muslims," he said. "We do not feel that we are met with revulsion in Muslim states, such as Malaysia, where we played in 1997." Gudker expressed his excitement over the latest award, which joins a similar prize won by the Israeli association in 2001. "It's a huge achievement. It's a project we promoted that was warmly received across the world," he said. "This award in general and the project in particular are a good example of how cricket can bridge, bring compromise, and teach us to accept others." The next move is to make cricket accessible to Arab Israelis in Israel's north, he said. Gudker used the opportunity to criticize authorities for failing to offer cricket the support it deserves. "Cricket is rather developed in Israel – there are 21 teams, school leagues, and youth leagues…in Beersheba, 2,000 kids are involved in projects related to the sports. Yet nonetheless, the State is unwilling to build a central cricket stadium and upgrade the sports to an international level," he said. See all talkbacks "Israeli cricket wins Dubai prize"